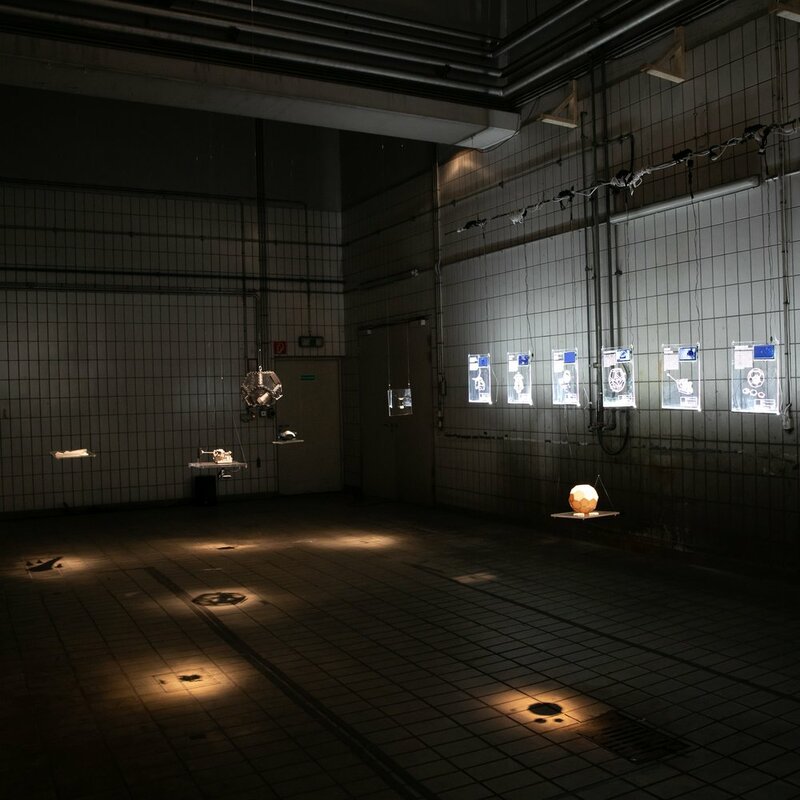 In September, 2018, the MIT Media Lab Space Exploration Initiative exhibited ‘A Glitch In The Stars’, a presentation of six works design for and flown on a zero gravity flight in 2018 to explore how art, design, and engineering could engage with the unique properties of microgravity environments. The exhibit was curated by Xin Liu, and designed/installed by Sands Fish and Nicole L’Huillier, and featured the designed objects floating throughout the exhibit space, while descriptions of each project hovered along the wall, both describing the projects and providing a brief video of each, embedded in the signs. It was one of a number of space-focused events in Linz, Austria this year. You can read more in CLOT Magazine’s coverage and on the Media Lab website. These works asked the question “What is human experience beyond the earthbound?” Featured were “Grappler” by Juliana Cherston (US), “Smells for Space” by Ani Liu (US), “Telemetron” by Nicole L’Huillier (CL) & Sands Fish (US), “TESSERAE” by Ariel Eckblaw, “Orbit Weaver” by Xin Liu (CN), and “Spatial Flux” by Chrisoula Kapelonis (US), and Carson Smuts (ZA/US). The exhibit was design such that the objects appeared floating in mid-air, on clear acrylic platforms suspended from the ceiling and spot-lit from directly above, providing an eclipse-like shadow on the floor below. The Telemetron, the piece suspended in the center of the room rotated, splashing light around the room, giving the appearance of an orbit. The installation was located in Post City, the main location for exhibits at the festival. Combining aesthetics, invention, and design, these projects imagine the human experience beyond the earthbound, beyond the technical and biological needs of survival.